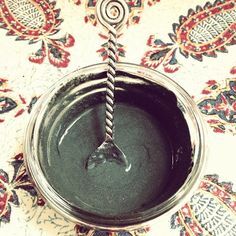 Thickeners - Some are made with thickeners such as locust bean gum, gelatin, carrageenan, and pectin. Additives like xanthan gum and corn starch are used to thicken the fruit part of flavored yogurts. While none of these thickeners are bad for you, they are just unnecessary. So why are they added to the yogurt? From what I’ve read, it appears that brands like Yoplait Greek only strain a portion of the milk (look for milk protein concentrate – see above). This means the yogurt is not thick enough on it’s own to achieve the “Greek-style” consistency, so they have to thicken it up with additives. Sweeteners – With the exception of plain yogurt, virtually all flavored varieties contain either sugar, fructose, stevia, or corn syrup. 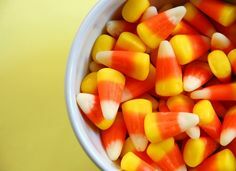 We all know we need to eat WAY less sugar. Chances are, if you add your own sweetener, you’ll use far less than what’s in flavored yogurt and you can sweeten to your taste. Over time, you may find yourself needing less and less. Before you know it Ms. Strawberry will be Ms. Plain and loving it. 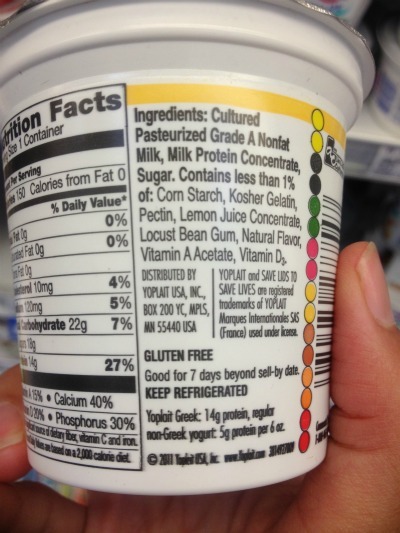 Colors – Somewhat surprisingly, I didn’t find any Greek-style yogurt with artificial colorings. I did see these: red radish color, caramel color, carmine, turmeric, and annatto. Gross factor – did you know that carmine is made from crushed, female, scale insects? Is plain yogurt sounding better yet? 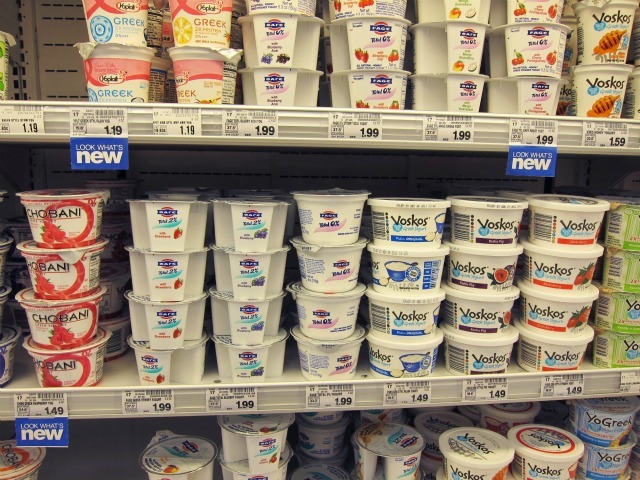 Flavoring – Natural flavors are found in many flavored Greek-style yogurts. The problem with natural flavors is you have no idea where or what the flavor was derived from. Again, unnecessary. Preservatives/Antioxidants – Potassium sorbate, citric acid, and lemon juice are added to maintain freshness and color (often of the fruit portion). 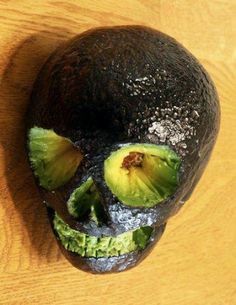 Fortunately, this list of preservatives are less problematic than most others, but regardless, you are far better adding your own fruit that doesn’t need to be preserved. rBST/rBGH – Always make sure your brand of yogurt (or any dairy for that matter) only uses milk from cows not treated with rBST. This growth hormone makes cows produce more milk and produce it for a longer period than they naturally would. This causes infection in the cow udders (mastitis). Virtually all cows treated with rBST are also on a consistent dose of antibiotics to reduce risk of infection. Certified organic diary does not come from cows treated with rBST. 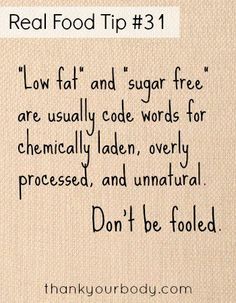 In general, the less processed a food and the more it resembles it’s original form, the better. Yogurt comes from milk and pure milk contains fat. Fat is good for you!!! Whenever possible, buy full-fat/whole milk yogurt as it is a more complete food. One recent European study suggests that Low-fat yogurt intake during pregnancy may heighten child allergy risk. The authors of the study do not offer any firm reasons as to why this may be, but it should be enough to make us pause and reconsider whether non-fat and low-fat dairy is truly best. The tide seems to be changing on saturated fat; case in point, read this article by Dr. Andrew Weil. If you eat a lot of yogurt, buy the bigger tubs. You’ll cut down on packaging. Greek-style yogurt can be used in place of sour cream in many recipes. A quick trip to the grocery store netted no less than 10 brands of Greek-style yogurt. This is one huge section in the yogurt aisle. Due to the sheer number of brands, I’ll be saving the brand comparison for our next blog post.